The Apple iPod nano 8th Generation is the perfect device to carry all your music collection everywhere you go. With a brilliant 2.5inch multipoint touchscreen, you can watch your favorite films and TV shows in crystal clear quality at a resolution of up to 240 x 432 pixels. The quality of the visuals is further enhanced by its pixel density of 202ppi. The iPod comes equipped with a powerful nonremovable lithium ion battery that offers an audio playback time of up to thirty hours and video playback time of up to 3.5 hours. The battery requires approximately three hours to charge completely. You can store your favorite soundtracks, films, TV shows, and more on this iPod with ease as it has an internal storage space of 16GB. 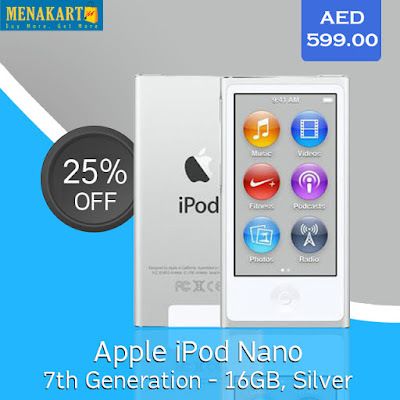 This 8th Generation iPod is available in a sleek silver finish that gives it a classy appeal. The Apple iPod Nano 8th Generation incorporates a feature called Genius. If you love a particular song, simply tap Genius to find songs similar to the current one. The Genius feature also creates a playlist and puts songs in it that you haven’t played in a while. This feature helps you find soundtracks you forgot you had and rediscover the magic. The Apple iPod Nano 8th Generation is equipped with a 2.5inch multipoint touchscreen that enables you to view content in crystal clear quality. The screen renders visuals at a resolution of 240 x 432 pixels. Feel free to watch episodes of your favorite TV shows, films, and more in high quality. The screen is extremely sensitive. Simply tap the screen to play, rewind, fast forward, and pause video clips. The Apple iPod Nano 8th Generation also features an FM radio that keeps you updated on the latest news stories. You can keep track of the score of your favorite sport and even listen to FM radio channels no matter where you are. To change stations, simply flick the radio dial and tap to set your favorite station. The Apple iPod Nano 8th Generation has Nike+ support and pedometer that enable you to keep a track of your steps, time, pace, distance, and calories burned. It also has built in Bluetooth technology that lets you connect the device to heart rate monitors and headphones wirelessly, making it easier to exercise while listening to your favorite songs and keeping a track of your heartbeat. Recently podcasts have become a trend, and you can find a podcast on any subject. With the Apple iPod Nano 8th Generation, you can listen to or watch any audio and video podcast. A podcast directory is included in iTunes that lets you browse through a selection of podcasts. You can subscribe to the one you are interested in, thereby enabling you to view or listen to every episode with ease.